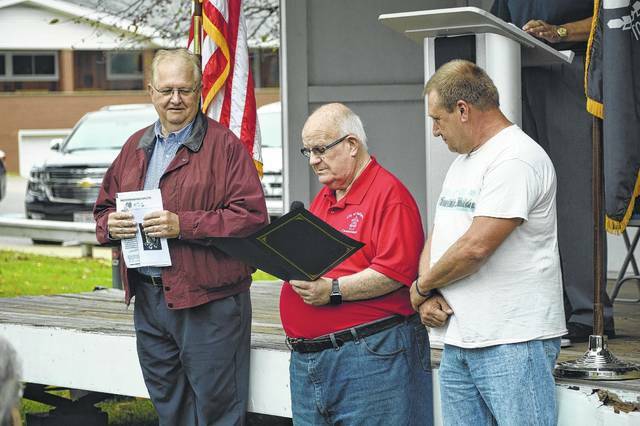 Gallia City Commission President Tony Gallagher, center, shares a proclamation from the city recognizing Sept. 15 as POW and MIA Recognition Day. City Commissioner Mike Fulks, right, and Gallia Commissioner Harold Montgomery, left, share in the measure. 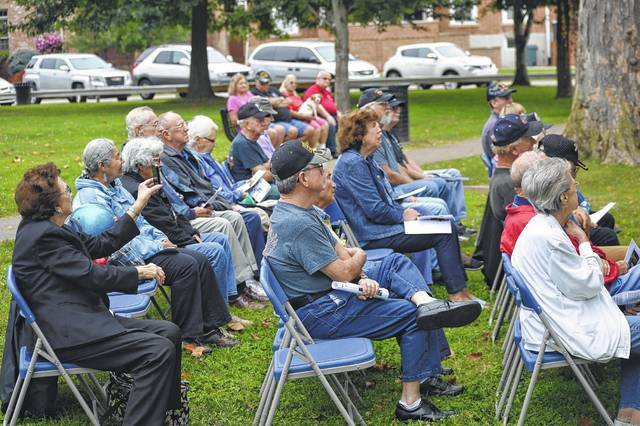 Veterans and residents gathered Friday morning to remember POW and MIA veterans in Gallipolis City Park. 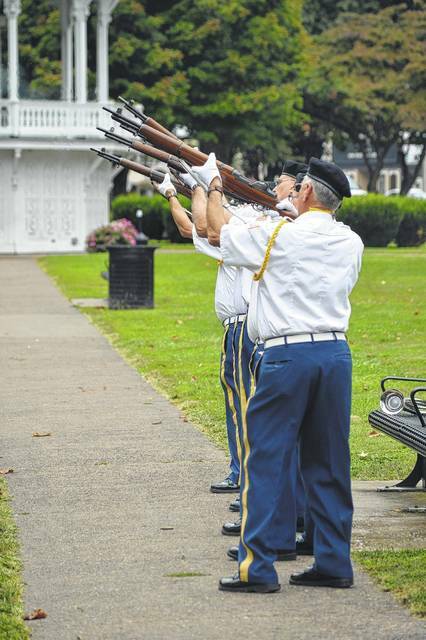 VFW Post 4464 Honor Guard holds a rifle salute. Annette Holiday leads the crowd in patriotic songs. Keynote speaker Jack Jackson led the day’s lesson in why it was important to remember those who were taken as prisoners and documented as missing in action during military conflict while looking at a table set in representation and honor to those who could not be with the community. The crowd gathers to remember veterans taken as POWs and gone missing in action. 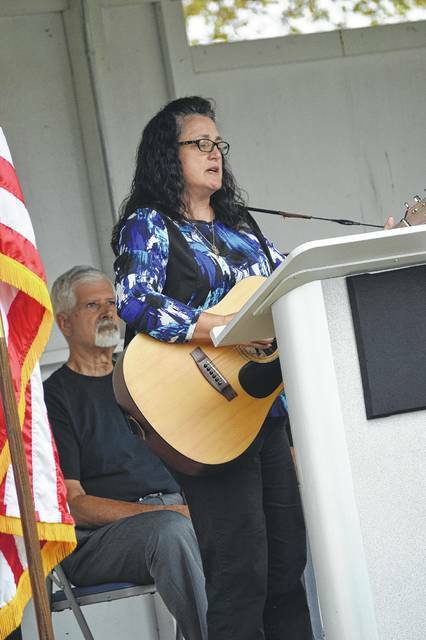 GALLIPOLIS — Area veterans and residents gathered in Gallipolis City Park Friday morning to remember the nationally-proclaimed POW and MIA Recognition Day in honor of those who had sacrificed for their country in the line of duty. Jim Cozza gave the introduction to the service and VFW Chaplain Keith Sheets gave the invocation.VFW Post 4464 Honor Guard presented the Colors and Annette Holiday led the crowd through the Star-Spangled Banner as well as other patriotic songs. Gallipolis City Commissioner Tony Gallagher read a proclamation for POW and MIA Recognition Day in support with Gallia Commissioner Harold Montgomery and City Commissioner Mike Fulks. 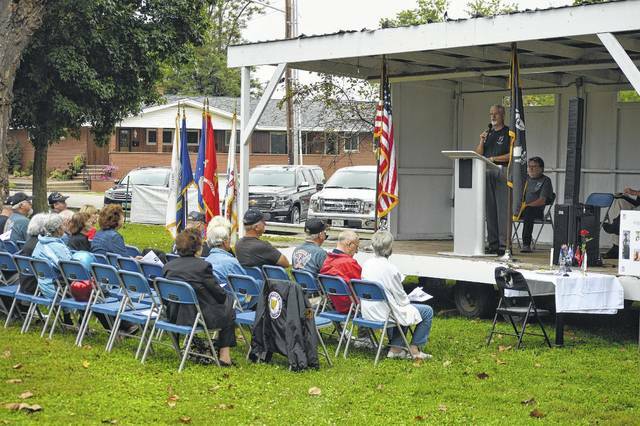 Gallia Veterans Service Commission President Gary Fenderbosch spoke of the significance of the Missing Man Table set in honor to remember those who had been taken as prisoners of war or gone missing in action. According to Fenderbosch, the table symbolizes the frailty of an isolated prisoner. The tablecloth is white and symbolic of the purity of the individual’s intentions to respond to their country’s call to arms. A single rose in a vase signifies the blood shed in sacrifice for country. The ribbon on vase represents the ribbons worn on lapels of the thousands who demand a proper accounting of comrades not among the public. The slice of lemon on a plate reminds others of the bitter fate of the missing. The salt on the plate reminds others of the tears shed as families wait for their loved ones return. The inverted glass is to remind others of those who cannot toast with their family and friends at the current time. The candles remind others of the light of hope that a soldier will return home. The American Flag reminds others that many may never return and reminds others of the pain and sacrifice to ensure freedom. Flags of the various military branches stand for those who served in their respective branches. The empty chair serves as the largest reminder of those who are still missing. 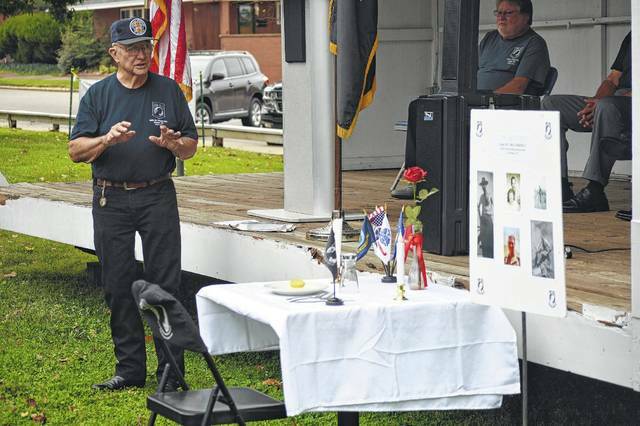 President of the Gallia Chapter of the Vietnam Veterans of America Larry Marr presented information in honor of a missing Gallia soldier named Fred Mooney whose body was never recovered. Of Northup, he was killed in action February 27, 1971 as an Army Sergeant 1st Class in the country Laos. Jackson previously served as a military chaplain in Bosnia. Jackson in the past has also served as a counselor to individuals who have suffered through trauma and addiction in his role as a chaplain.